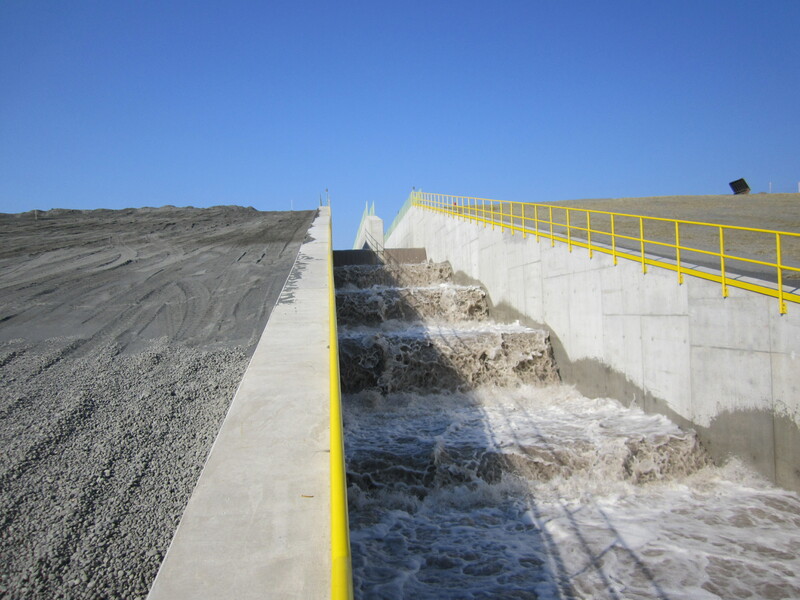 Water began flowing through a dam spillway at a taconite plant in northern Minnesota, culminating a two year construction observation and testing project for Braun Intertec. The dam spillway project included construction of a new reinforced concrete stepped spillway structure over the natural ground island along the edge of the site’s interior dam. The structure consists of an upstream inlet channel with wing walls, 300-foot long concrete sluiceway, a series of downstream concrete steps and a downstream outlet with wing walls. Approximately 80,000 cubic yards of excavation was completed along with 746,000 cubic yards of tailing material placed as part of the foundation, backfill and abutment dam fill. Additionally, approximately 5,650 cubic yards of reinforced concrete was placed for base slabs, walls and piers. Braun Intertec provided full time construction observations, concrete testing, concrete temperature monitoring, instrumentation monitoring and compaction testing. Braun Interport, a secure client portal, was showcased as an efficient way to post our results to the project team and was well received by the mining client as well as the design consultants.